The American flag has been lowered in Baghdad, bringing nearly nine years of US military operations in Iraq to a formal end. Leon Panetta, the US Defence Secretary, told troops the mission had been worth the cost in blood and dollars. Leon Panetta said the years of war in Iraq had yielded to an era of opportunity in which the US was a committed partner. 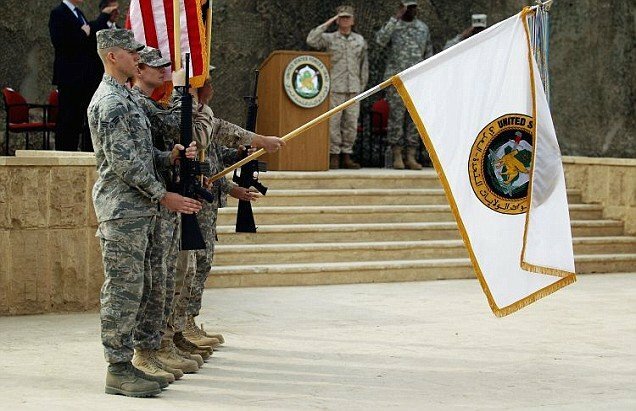 The symbolic ceremony in Baghdad officially “cased” (retired) the US forces flag, according to army tradition. Leon Panetta told US soldiers they could leave Iraq with great pride. “After a lot of blood spilled by Iraqis and Americans, the mission of an Iraq that could govern and secure itself has become real,” he said. “They have been difficult years,” he told the BBC. “We have had some successes together. We had some failures. We have some mishaps. Iraq war has cost the US some $1trillion. Republicans have criticized the pullout citing concerns over Iraq’s stability, but a recent poll by the Pew Research Centre found that 75% of Americans backed the troop withdrawal. President Barack Obama, who came to office pledging to bring troops home, said on Wednesday that the US left behind a “sovereign, stable and self-reliant Iraq”. In a speech in North Carolina to troops who have just returned, Barack Obama hailed the “extraordinary achievement” of the military and said they were leaving with “heads held high”. “Everything that American troops have done in Iraq, all the fighting and dying, bleeding and building, training and partnering, has led us to this moment of success,” President Obama said. Barack Obama said the war had been “a source of great controversy” but that they had helped to build “a sovereign, stable and self-reliant Iraq, with a representative government that was elected by its people”. He announced in October that all US troops would leave Iraq by the end of 2011, a date previously agreed by former President George W. Bush in 2008. A small contingent of some 200 soldiers will remain in Iraq as advisers, while some 15,000 US personnel are now based at the US embassy in Baghdad – by far the world’s largest. “No-one trusted their promises, but they said when they came to Iraq they would bring security, stability and would build our country,” Ahmed Aied, a grocer, told Reuters news agency. Barbara Walters to Kim Kardashian: "You don't have any talent!"